Seacoast defense was a major concern for the United States from its independence until World War II. Before airplanes, America's enemies could only reach her from the sea, making coastal forts an economical alternative to standing armies or a large navy. 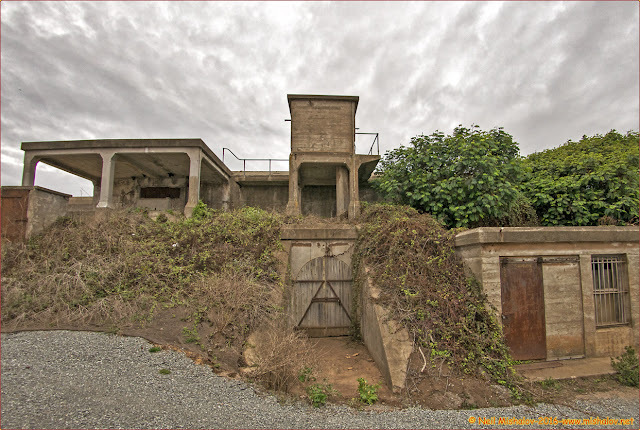 After the 1940s, it was recognized that fixed fortifications were obsolete and ineffective against aircraft and missiles. However, in previous eras, foreign fleets were a realistic threat, and substantial fortifications were built at key locations, especially protecting major harbors. In 1885 US President Grover Cleveland appointed a joint army, navy and civilian board, headed by Secretary of War William C. Endicott, known as the Board of Fortifications. The findings of the board illustrated a grim picture of existing defenses in its 1886 report and recommended a massive $127 million construction program of breech loading cannons, mortars, floating batteries, and submarine mines for some 29 locations on the US coastline. Prior efforts at harbor defense construction had ceased in 1876. Since that time the design and construction of heavy ordnance advanced rapidly, including the development of superior breechloading and longer-ranged cannon, making the US harbor defenses obsolete. In 1883, the Navy had begun a new construction program with an emphasis on offensive rather than defensive warships. These factors combined to create a need for improved coastal defense systems. The Endicott Board’s recommendations would lead to a large-scale modernization program of harbor and coastal defenses in the United States. This program would lead to the construction of reinforced concrete fortifications and the installation of large caliber breech-loading artillery and mortar batteries. Endicott period projects were not fortresses, but rather a system of well-dispersed emplacements with only a few large guns in each location. The batteries were usually open-topped concrete walls protected by sloped earthworks. Some of the gun batteries featured disappearing guns, which sat protected behind the concrete walls but could be raised to fire. Underwater mines were a critical component of the defense operation, and smaller guns were employed to protect the mine fields from minesweeping vessels. 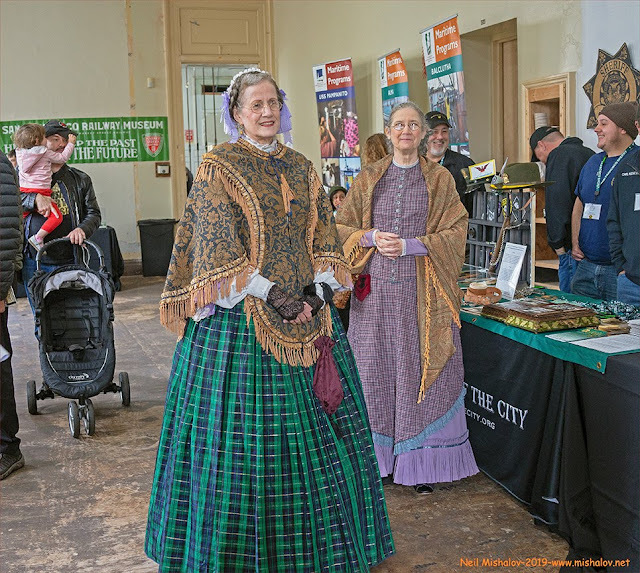 Originally established as a Spanish garrison in 1776, the San Francisco Presidio was in continuous use as a military post from 1776 to 1993. 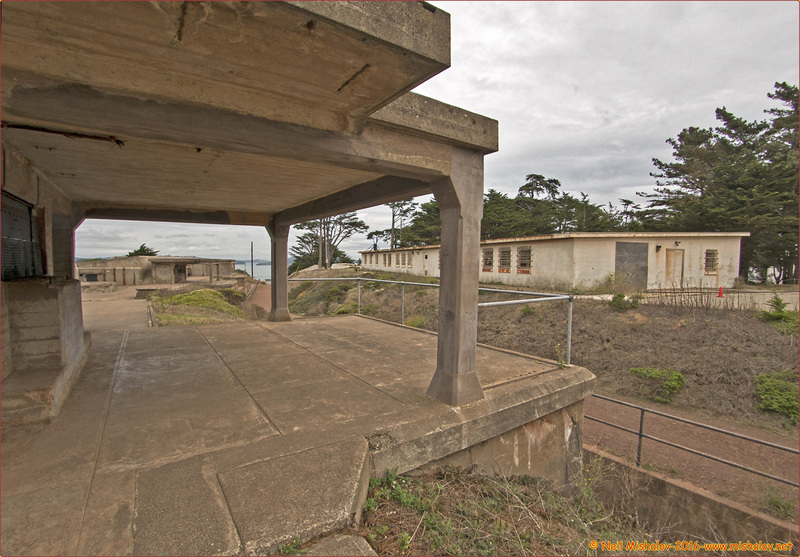 The Presidio was used by the U.S. Army for many activities; it was the staging point for Army personnel for all activities in the Pacific Theater until well past WWII. A National Cemetery at the Presidio contains the final resting place for more than 26,000 military personnel who served in American Wars from 1846 onwards. During the latter part of the 20th Century, it was the Headquarters of the U.S. 6th Army. In 1991 Congress decided to close the post and most of the land was transferred to the National Park Service. 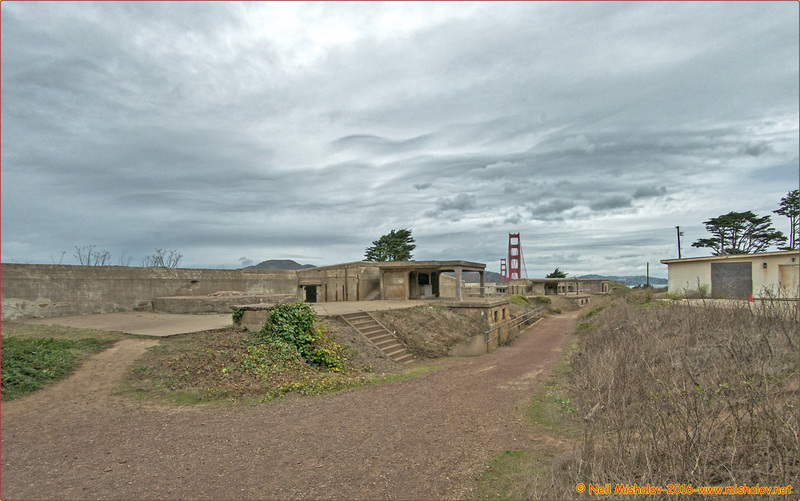 There were 15 gun batteries constructed at the Presidio during the Endicott Era. 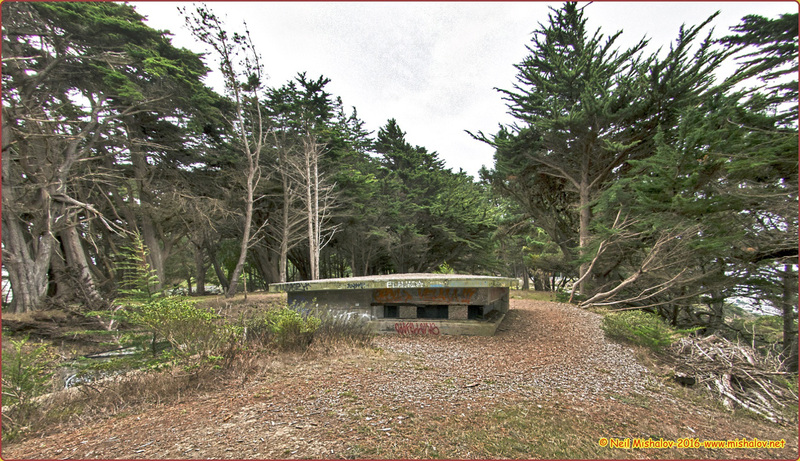 Many of those gun batteries are still standing; they are mostly deserted and forgotten. This photo gallery includes photos of Battery Boutelle, Battery Godfrey, Battery Crosby and Battery Marcus Miller; four of the fifteen gun batteries which were active at the Presidio. 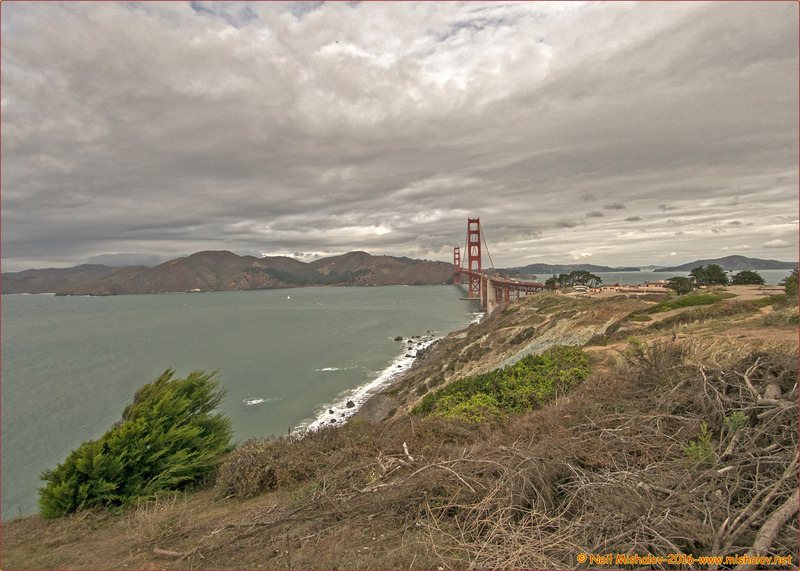 This is a view from the Presidio; it shows the Marin Headlands and the Golden Gate Bridge. Battery Boutelle and Battery Marcus Miller are also visible but just barely. Click the image to see the full-size photo. The total distance traveled during the ramble was approximately 2.4 miles. 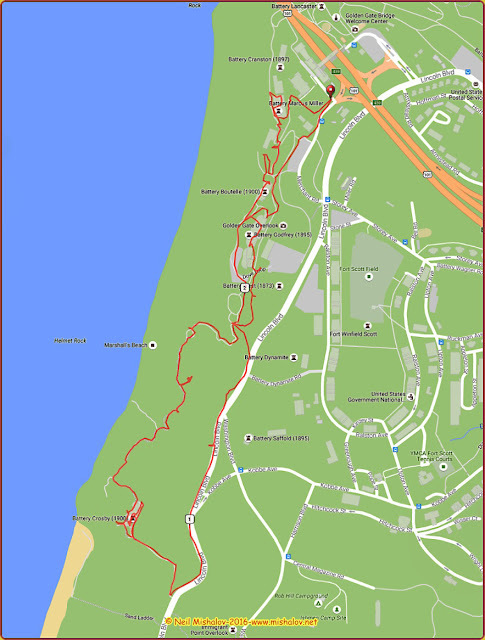 Mile markers are displayed on the GPS generated track. Click the image to see the full-size map. This view shows both Battery Boutelle and Battery Marcus Miller. 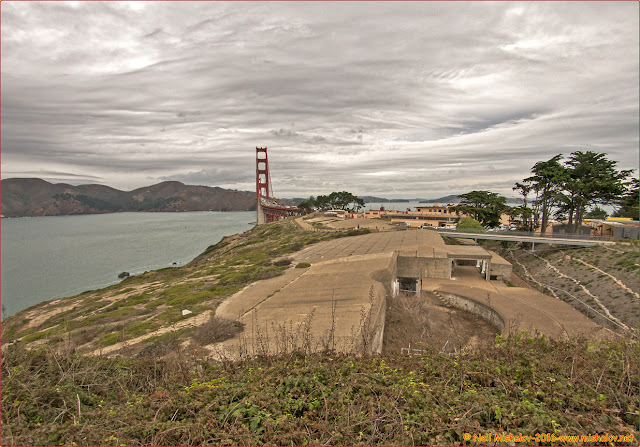 Battery Boutelle is closest to the camera, and Battery Marcus Miller is near the southern terminus of the Golden Gate Bridge. The view is looking North. Click the image to see the full-size photo. 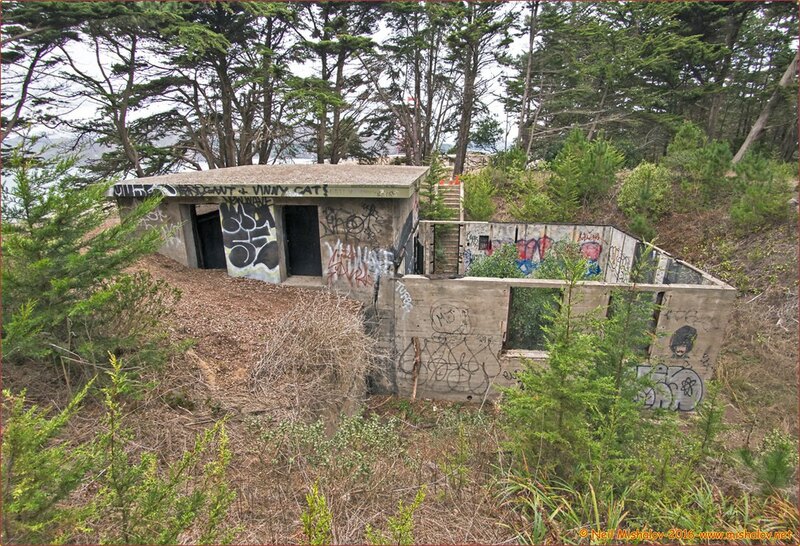 Battery Marcus Miller: Construction of Battery Marcus Miller began in 1891. 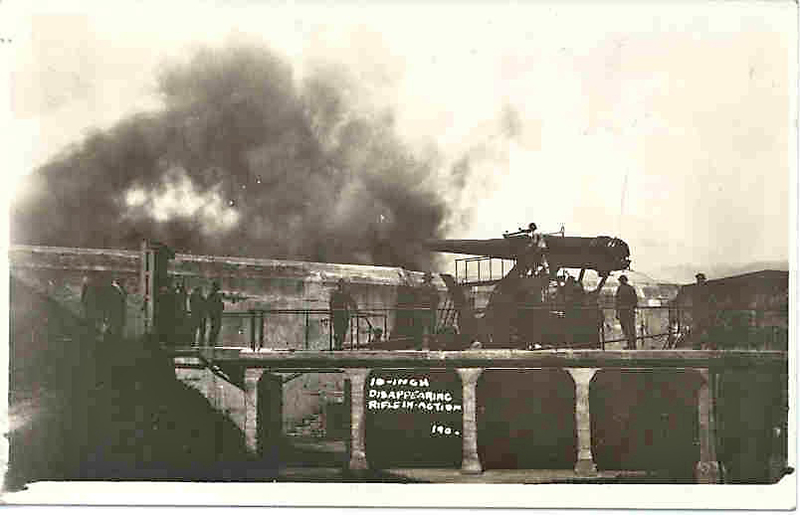 The battery was commissioned for operation in 1898 after three disappearing 10-inch guns were mounted. The guns had a range of seven miles. The Battery was deactivated in 1918. Click the image to see the full-size photograph. A view of the No. 3 gun emplacement at Battery Marcus Miller. 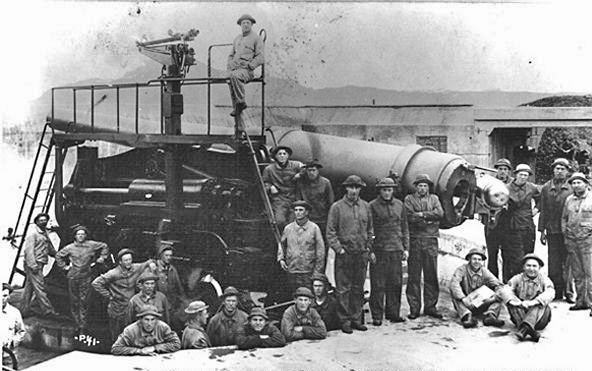 These soldiers were assigned to operate this 10-inch disappearing gun. Photograph circa 1910. Click the image to see the full-size photograph. Battery Marcus Miller Then: A test firing of the 10-inch disappearing gun at gun emplacement No. 3. Photograph circa 1910. Click the image to see the full-size photo. 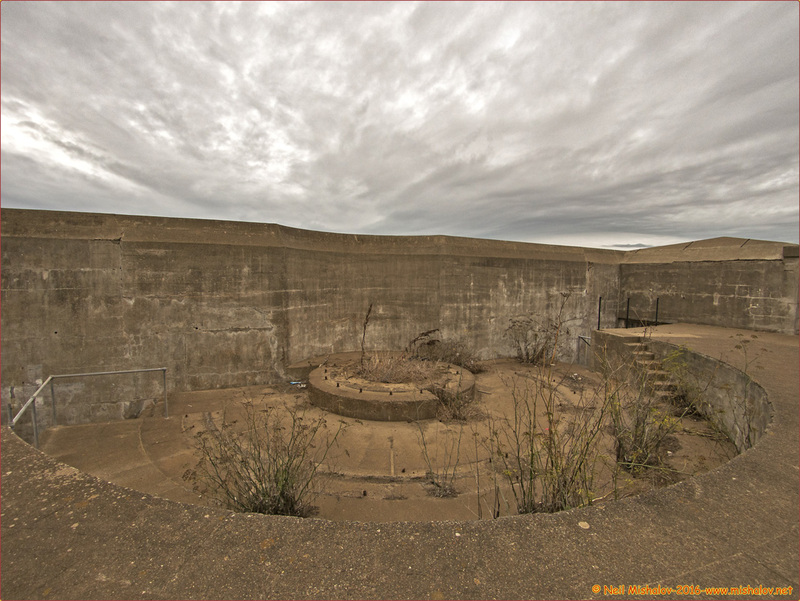 Battery Marcus Miller Now: A 10-inch disappearing gun emplacement at Battery Marcus Miller. Click the image to see the full-size photograph. 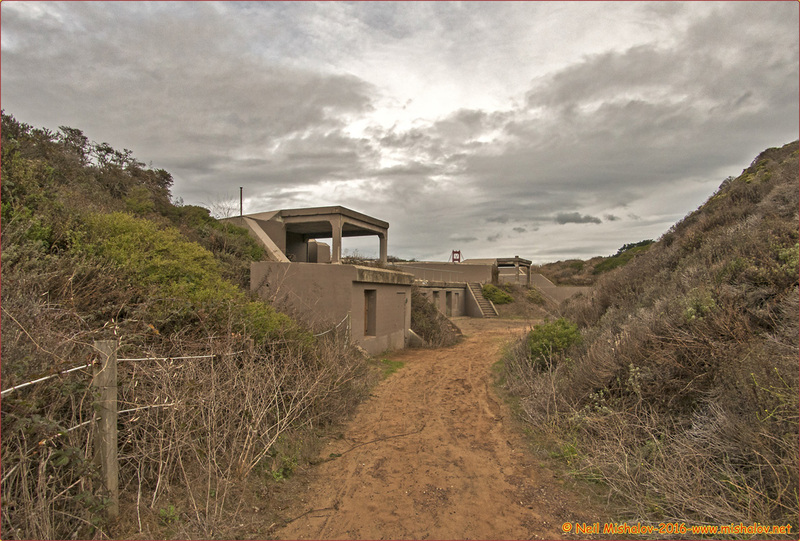 Battery Boutelle. 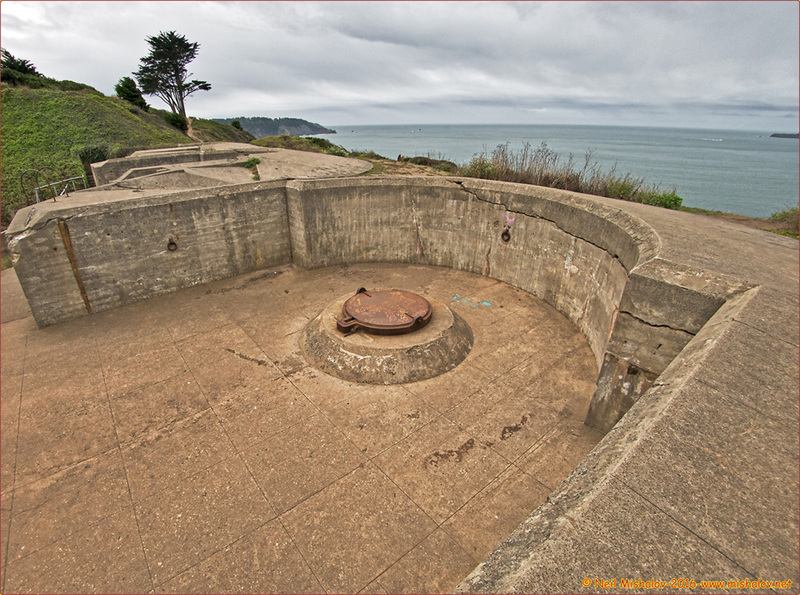 This gun emplacement had three 5-inch guns; it became operational in 1901. The Battery was de-commissioned in 1918. Click the image to see the full-size photograph. The remains of the Pedestal Mount at Gun Emplacement No. 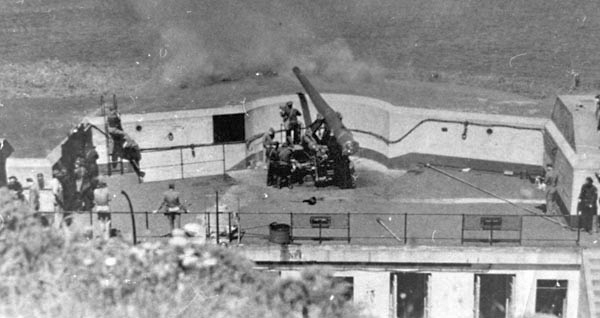 3 at Battery Boutelle. Click the image to see the full-size photograph. Battery Godfrey Then: In 1892 construction began at the Presidio to build Battery Godfrey. The construction crews built reinforced concrete emplacements to mount three 12-inch guns. The work was completed in 1896, and Battery Godfrey was the first Endicott Era battery to be operational in defense of San Francisco Bay. Three Model 1888 breech-loading guns, manufactured at Watervliet Arsenal were installed and were operational from 1896 to 1943 when Battery Godfrey was decommissioned. This photo was taken at Battery Godfrey circa 1910; it shows soldiers at the No. 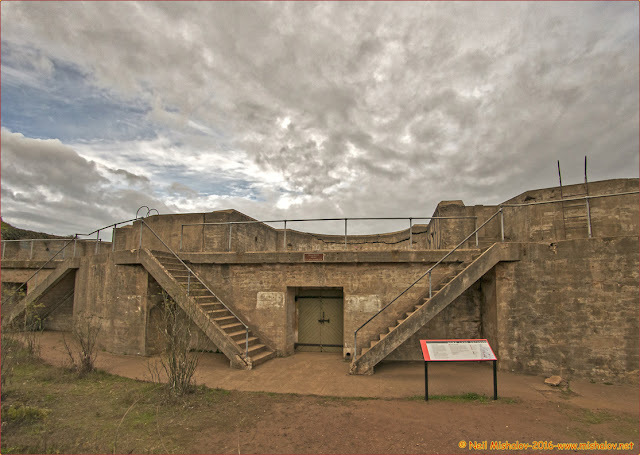 2 gun emplacement. Click the image to see the full-size photo. 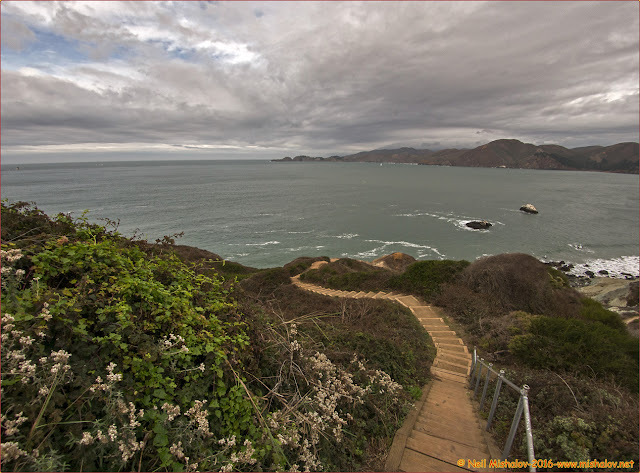 Battery Godfrey Now: Click the image to see the full-size photograph. This photo was taken at Battery Godfrey circa 1910. 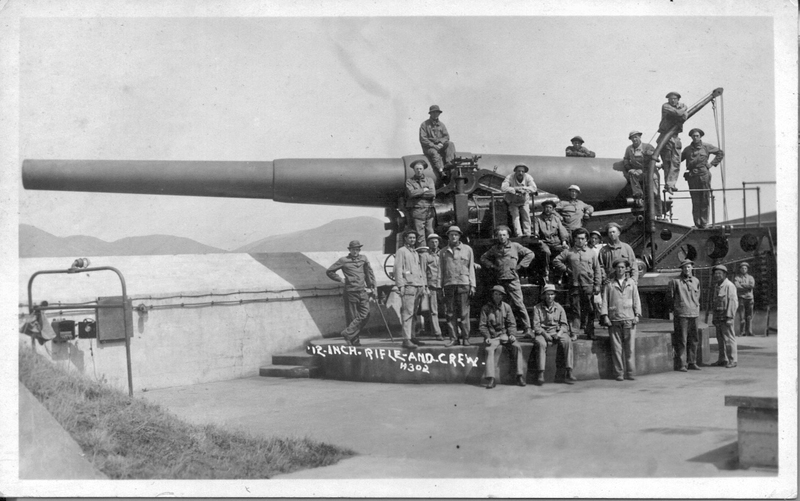 It shows soldiers loading a 700 pound round into the breech of a 12-inch gun. Click the image to see the full-size photograph. 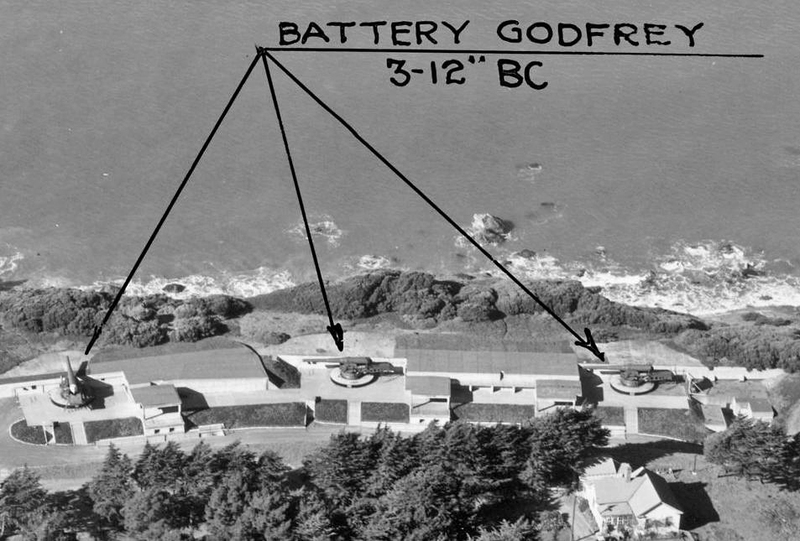 Battery Godfrey as seen in 1938: Click the image to see the full-size photograph. Battery Godfrey Now: Presidio Building No.1648 is visible in the rear. Click the image to see the full-size photo. Battery Godfrey's Commander's Observation Post. The view is looking South. Click the image to see the full-size photograph. The Commander's Observation Post is visible. 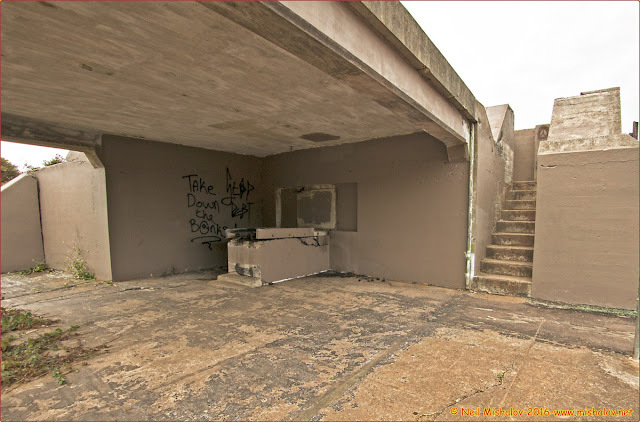 The Gun Plotting Room is behind the observation post. The view is looking North. Click the image to see the full-size photo. Baker Beach with the Sea Cliff neighborhood of San Francisco beyond the beach. 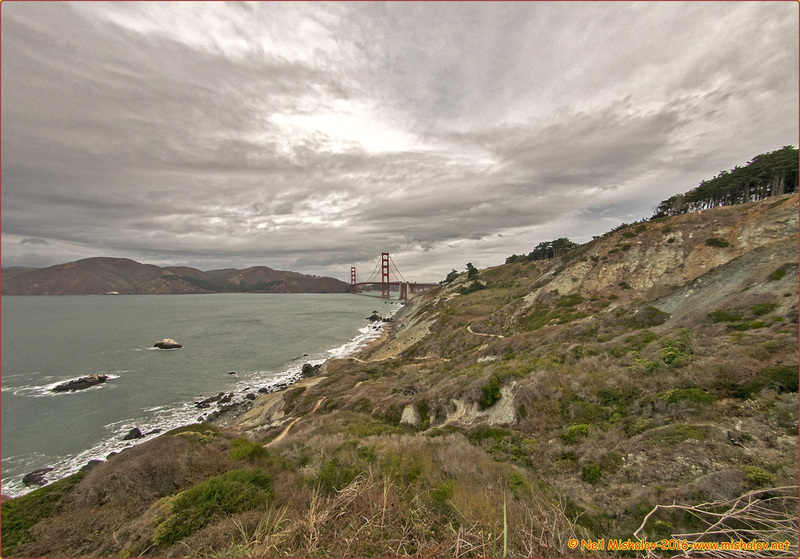 Lands End is visible in the rear. The view is looking West. Click the image to see the full-size photo. Battery Crosby. This gun emplacement became operational in 1900; it was de-commissioned in 1943. Click the image to see the full-size photograph. Battery Crosby Then. The picture was taken in 1938. Click the image to see the full-size photograph. Battery Crosby. Click the image to see the full-size photograph. Leaving Battery Crosby. Click the image to see the full-size photo. 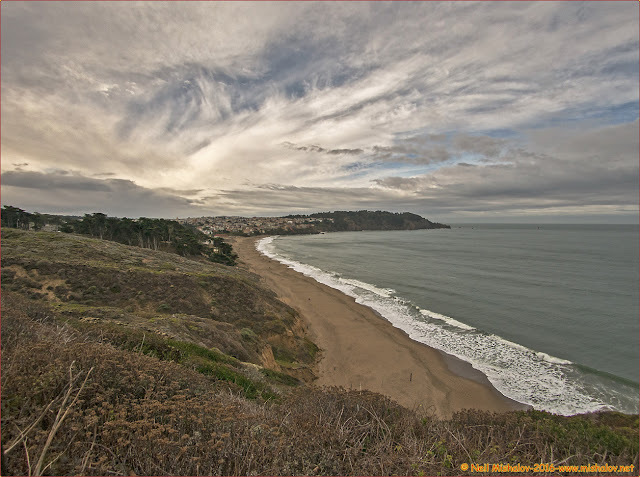 Marshall Beach is visible. Click the image to see the full-size photograph. The first San Francisco Bay Area Photo Blog contains galleries of photographs that were posted between 2002 and 2011. Click Here to view the 2002 to 2011 photo galleries. A Panasonic GX7 camera body mounted with a wide-angle Olympus 9mm lens was used to take these photographs.